In the Talking Tea tradition, we'll be in conversation with Zhen Lu and Phil Rushworth of Zhen Tea, a Chinese tea company based in Ottawa and past guests on Talking Tea, to look at the full spectrum of Chinese teas. You'll enjoy 6 different teas with us, explore the nuances of tasting-grade teas and bring home pro-tips on how to make delicious tea easily. For the tea savvy and beginners alike, in this two-hour session we'll be talking about some of the most important topics in Chinese tea: the history and regions of tea, tea categories, production and processing, the Chinese method of tea brewing, tea storage, and health benefits of tea from a traditional Chinese perspective. This is an interactive event, so we'll discuss any questions you might have about Chinese tea. 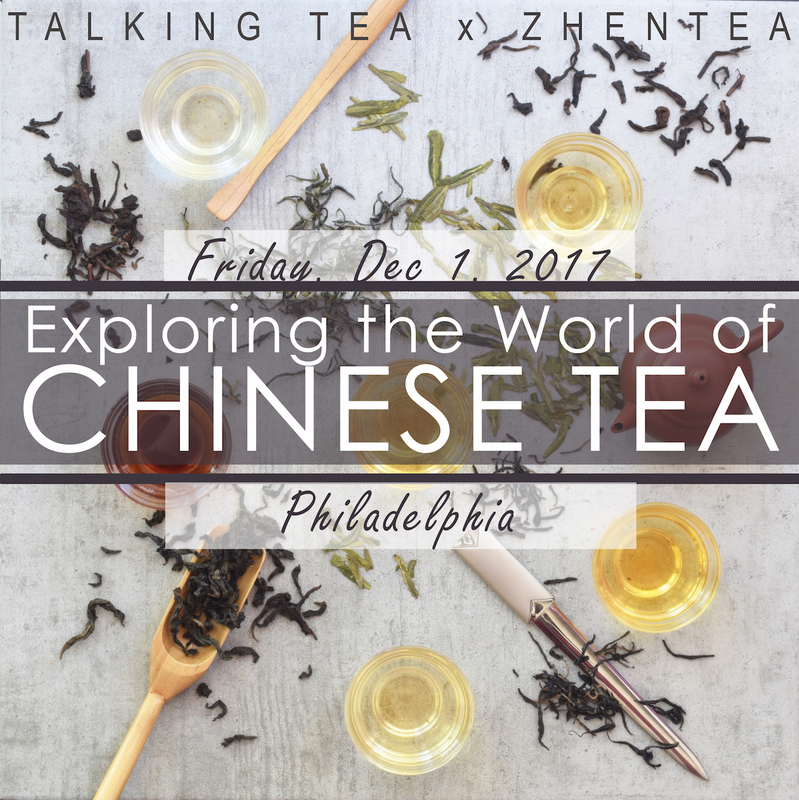 But it's a live event only - we won't be recording it - so join us in Philadelphia on December 1 for Exploring the World of Chinese Tea. White tea – Bai Mu Dan. A signature white tea with prominent flavor. Green tea – Lu’an Gua Pian. The only green tea made exclusively with mature leaves. Yellow tea – Huoshan Huang Ya.The same cultivar, terroir, and harvest time as Lu’an Gua Pian, but one more step during the process. A perfect showcase for the delicacy and nuance of yellow tea. Oolong tea – Tie Guan Yin Classic. This traditional version of the most popular oolong tea demonstrates the beauty and complexity of the oolong tasting profile. Black tea – Dian Hong. An innovation of the ancient cultivar of tea that's widely enjoyed. Dark tea – Shu Pu’er 2009. An 8-year aged Shu Pu’er introduces the unique tasting notes of dark tea. 7 PM to 9 PM, Friday, December 1, 2017. Independence Foundation Learning Lab at the Asian Arts Initiative, 1219 Vine Street (studio B), Philadelphia, PA, 19107. Map it.